We thank the Special Rapporteur for his report and echo his calls to address the problem of Palestinians being denied the benefit of their own natural resources. The law of belligerent occupation, like much of international humanitarian law, is meant to protect civilians from the ravages of armed conflict. As a result, the law is very clear that the daily administration of an occupied territory must be done for the benefit of the local population. The occupying power is responsible for preserving local civic life and respecting the legal rights of all civilians in the territory. This responsibility has been clearly violated in the occupied Palestinian territories with regard to natural resources. But not only have natural resources been expropriated from private individuals without proper compensation and degraded by deliberate environmental pollution, Palestinians are denied access to justice for these wrongs. The occupation arrangement put in place by Israel effectively prevents Palestinians from obtaining legal redress for these wrongful acts against them and their resources or for the resulting health and financial harm they cause. The occupation administration results in under-resourcing local Palestinian judicial institutions, near-total denial of jurisdiction for Palestinian tribunals over Israeli parties, and, as a result, forcing Palestinians to resort to Israeli courts, which are widely viewed to have a systemic bias against Palestinian parties. 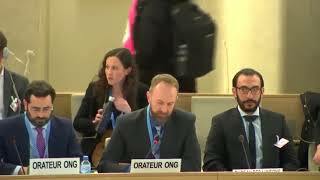 We would like to know the Special Rapporteur’s views as to what measures can be taken to provide Palestinians access to justice either within or outside the Israeli court system. Mr. President, Natural resources are literally the life support system of any country, including the occupied Palestinian territories.